In my old technology posts thus far I have talked about power sources, but i have yet to talk much about how this power is utilized. In the modern world where every little gadget, power tool, and machine seems to be driven by electricity, it's easy to forget that all of that power has to come from somewhere. Electric cords just blend into the background, and battery powered devices eliminate the cords entirely, but this is an incredible luxury compared to what was previously done to operate machines. Look back at my post on the Aldie Mill in Virginia. You'll notice the power from the waterwheel is transferred directly to the millstones by way of large shafts and gears. This works well for one or two devices, but what if you want to transfer that power to multiple machines? 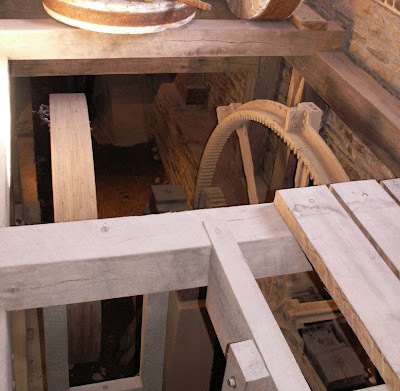 When the mill was upgraded over the years, it began to use roller mills, similar to these. To completely process grains, you typically needed several units. In order to power them, the mill began to use line shafts. 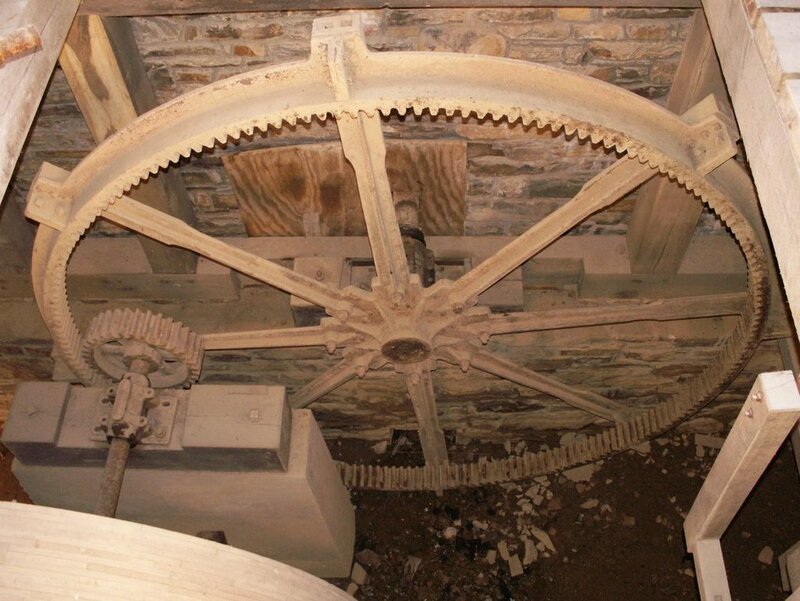 Here, one of the waterwheels is connected, by way of a large pair of reduction gears to a pulley. This would, when operational, have a large belt connecting it to a much smaller pulley on another shaft. That shaft could then be extended to nearly the length of the building. 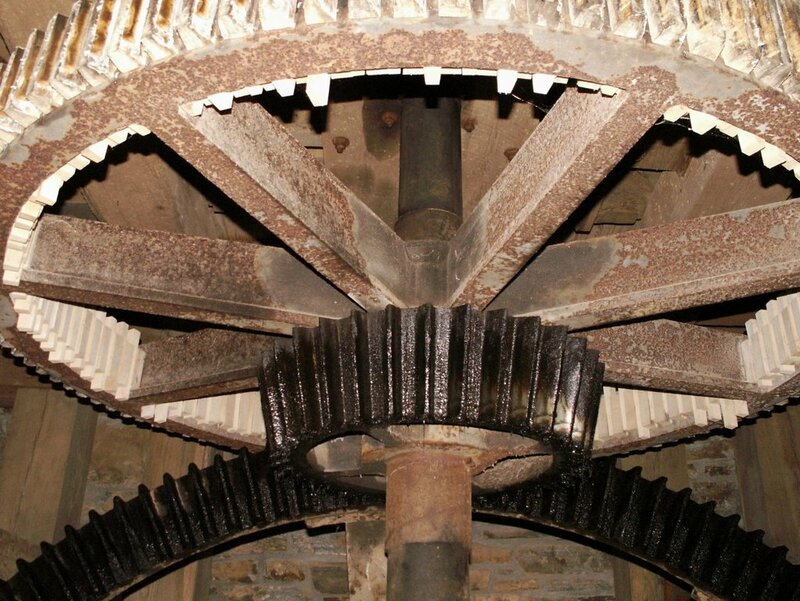 Wherever power was needed for a roller mill, fan mill, or other device, a pulley was placed on the shaft. That pulley, and another belt, would transfer power to the machine below. Of course if you can do this with water, you can do this with steam or gas engines as well. This is why most older engines either had a large pulley attached to the crankshaft or else had a wide flat flywheel that could be used to run a belt. To make this a little easier to understand, let's look at a model. This miniature machine shop is made up mostly of kits from PM Research who display and sell their wares at the Old Threshers Festival. Here, a model steam engine is connected to a line shaft, via a belt. This shaft runs the length of the building, and is connected to other shafts and machines, all of which could be powered by the engine at the same time. Of course, this has some potential complications. Very seldom will all of the machines in a shop need to run at the same speed, yet when they are all running at the same time, you can't just change the speed of the steam engine to suit one particular machine. This is why different sizes of pulleys are used. Two pulleys of different sizes act in much the same way that two gears of different sizes will act. A large pulley when connected to a smaller pulley, will cause the smaller pulley to spin at higher RPMs. By using this knowledge, you can have a line shaft that spins at a set speed throughout a facility, and yet have machines running at various different speeds. To complicate matters further, some machines needed the ability to be adjusted to run at multiple speeds. Sometimes it was necessary to stop a machine entirely. This created another problem because nobody wanted to shut down an entire factory just to work on a single machine. It became necessary to isolate machines from the line shaft. I'm sure there were several possible methods for this, but the simplest was simply to move the belt to an idler pulley. 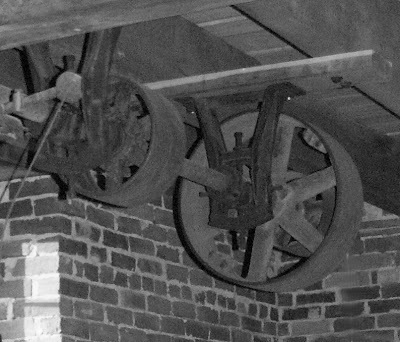 Either on the machine or on the line shaft, a free spinning pulley could be mounted so that when a machine needed to be stopped, the belt was simply moved from the main pulley to the idler pulley, where it could not transmit any power. Similarly, a belt might be allowed to go slack, so that there was not enough friction between the belt and the pulley to transmit any significant force. Both methods worked, even though they were far from perfect. Still, systems like this were used in all manners of facilities from machine shops and factories, to grain or textile mills, and other manufacturing facilities. Over the years, they would be used with waterwheels, steam engines, gas engines, diesel engines, and eventually, they would even be adapted to run under power from large electric motors. The line shaft system did have drawbacks. All of the moving parts created plenty of friction, so efficiency suffered. It also required considerable time and effort to make sure that all of the line shafts were well maintained and lubricated. Safety was one of the primary drawbacks of a line shaft operated facility. Even though machines could often be disconnected, it was rare to completely shut down a system, so people were often injured by working on moving equipment or trying to put belts back on pulleys after they had slipped off. Unguarded belts and pulleys can be particularly hazardous because of their ability to catch appendages or loose clothing and pull people into moving equipment. The same can also be said for the line shafts themselves. Keeping out of moving machines required considerable care and attention, both of which were hard to come by in the typical old bustling factory. All of these problems could not be ignored, and when electric motors became smaller, economical, and readily available, factories began using machines powered by electric motors instead. Sometimes, entirely new machines were purchased that had motors built in. In some cases though, shops would refit their existing equipment to run without a line shaft. Here is an example of an old drill press that would originally have be run by a belt from a line shaft. It has since had an electrical motor mounted on it, which turns the pulley that was originally used to power the drill. The adjustable speed pulleys are still intact, and the old mechanism has not been changed. In fact, except for the motor and an on/off switch, this drill press is virtually identical to what would have been found in any old machine shop. Home made conversions like this one, no doubt offered a cost effective way of running old equipment, even when maintaining an old line shaft system became impractical. Today, this sort of system has faded out of use in most places. Your best chance of seeing a line shaft driven shop would be in a museum. If you get the chance, though, it's interesting to see a shop like this in action. I'm actually studying mechanic of meterials for civil engneering. I'm also interested in economic paradigm shift. I felt that the chapter about torsion might have had very interesting applications in old factories. I found your site. Take you, I found exacly what I looked for.